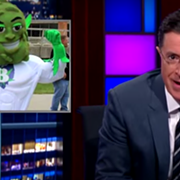 A couple of years ago, Scene's former editor wrote an open letter to Stephen Colbert asking him to be the president of Cleveland. Turns out Stephen had better things to do and couldn't take us up on the offer, but that didn't change the fact that Stephen was always welcome here. "We'll finally get the answer to the question: Would anyone choose to live in Cleveland for $30 million?" Boo, Stephen. We hereby rescind our offer. Watch the video below.